Irish coffee is a classic coffee cocktail that is a great way to warm up on a cold night, especially if you like Irish whiskey. The drink is deceptively strong, given that it has a thick pillow of whipped cream on top. I often like Irish cream in my coffee as a milder, sweeter alternative to traditional Irish coffee. This Irish Espresso combines the best of both, spiking coffee with both Irish cream and Irish whiskey for a creamy coffee drink with a bit of a kick. The drink is very easy to make – especially if you already have your Irish ingredients on hand. I used sugar and equal parts of both Irish cream and whiskey, then added espresso and steamed milk to finish. The sugar helps to meld the ingredients together, but the drink isn’t overly sweet and you might find that you prefer a little more (or a little less) sugar when you make yours. It’s a delicious, warming drink that is a great way to end a meal, but could also be served during brunch instead of a batch of mimosas! 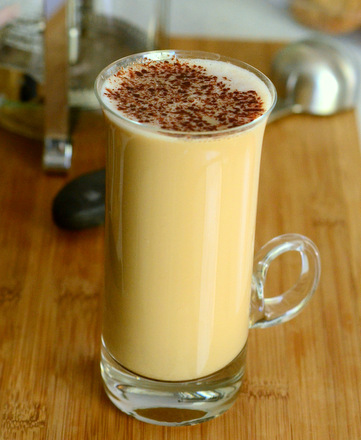 As usual, you can use coffee in this recipe if you don’t have an espresso machine. If you’re using coffee, use 4-6 oz of hot coffee and 4 oz of steamed milk (which you can make without a steamer) to finish your drink. In a tall mug, combine whiskey, Irish cream, brown sugar and espresso. Stir to combine and dissolve the sugar. Top with steamed milk. Garnish with chocolate shavings.